Everyone at some point in his/her life has been lied to, led on or misled…betrayed. The result? Future difficulty in learning to trust again. 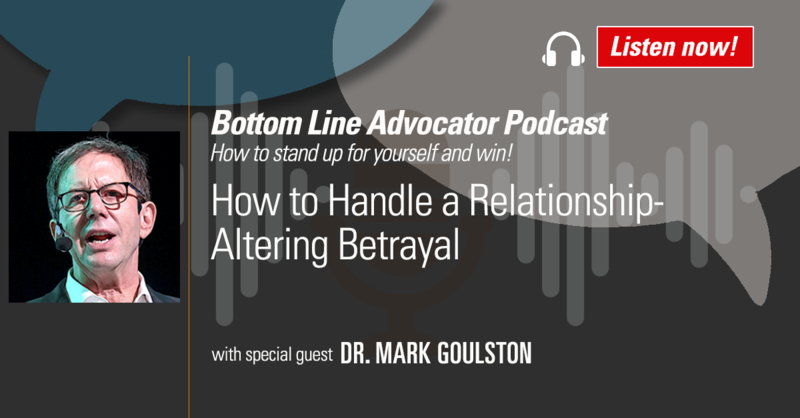 In this episode, Bottom Line President Sarah Hiner is joined by prominent psychiatrist Dr. Mark Goulston, FBI and police hostage negotiation trainer and suicide specialist to talk about trust and betrayal. Dr. Goulston has talked to thousands who have been betrayed. He has seen their pain and helped them work through their future. His 4 H’s of betrayal must be identified and overcome—Hurt, Hate, Hesitancy, Holding On. Listen in as Dr. Goulston explains his formula for addressing betrayal, which he has been successfully preaching and teaching for more than 25 years.